Using classic and contemporary stitches, our aran yarn selection includes a collection of beautiful aran knits for all the family. Every popluar King Cole Patterns from baby garments to household items. 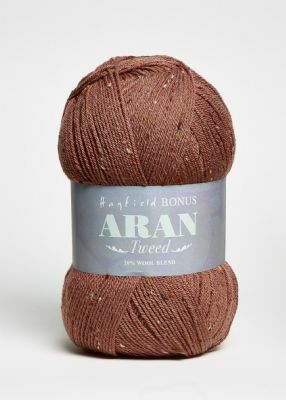 Hayfield Bonus Aran Tweed is a beautiful, tweedy yarn with subtle kemps and coloured fibres that creates stunning aran hand knits with added interest. It comes in a blend of 74% acrylic, 20% wool and 6% viscose, making this yarn machine washable, and in a great value 400g ball. The Aran Tweed palette has pretty and naturally rustic aran shades for all the family and this is a standard aran yarn, which knits to all Sirdar and Hayfield aran designs. Hayfield Bonus Aran is our great, classic aran yarn and is made using a beautifully soft blend of 20% wool and 80% acrylic. 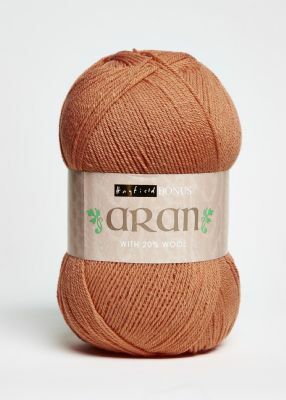 This yarn comes in a great value 400g format and is perfect for knitting all those classic aran sweaters, cardies and accessories for all your family and friends. This yarn is machine washable and easy to care for and incredibly satisfying to knit. There are fabulously vibrant, fashion shades and classic aran colours for all the family and, as this is a standard aran yarn, it knits to all Sirdar and Hayfield aran designs. INCLUDES FREE SUMBLIME LUXURIOUS ARAN PATTERN BOOK WORTH £11.99 WITH ALL ORDERS OF THIS YARN. A beautifully soft aran weight yarn. It is high quality and supported by some delightful patterns to keep your babies and toddlers cosy and warm. 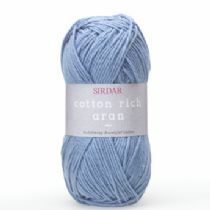 Cotton Rich Aran is a contemporary take on a classic Aran yarn. It is a light weight summer yarn with a soft, matt appearance and comes in a range of classic, modern shades, including Strawbs red, Herb green and Marin blue. The are 8 leaflets and the ‘Cotton Rich Aran’ book 481 with designs for each member of the family, whatever their age and style. Giselle Aran is a dramatic space-dyed yarn with a glistening copper metallic thread and neps. Giselle has a 43% wool, 43% acrylic, 14% metallic polyester blend, meaning that it is the perfect combination of wooliness and metallic to be both warm and glamorous this winter. It has a gorgeous design package for women and girls that includes lace, cable and stocking stitch hand knits, as well as crochet designs. Giselle is machine washable on a delicate wool cycle and knits to all Sirdar Aran designs. 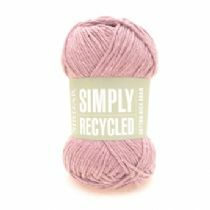 Simply Recycled Aran is a beautifully simple yarn and is made using recycled cotton fabric from t-shirt production blended with acrylic to make a new, soft yarn that’s wonderfully easy to use, and easy to care for too. It comes in 12 fashionable, high summer colours including sun-baked terracotta, tan, cyprus green, citrus yellow, stylish grey and natural stone shades. Simply Recycled Aran is just so versatile – it’s a great yarn to use for hand knits and crochet designs for women, men and girls. 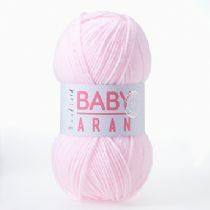 This is the softest Sirdar aran yarn designed specially for babies and toddlers. 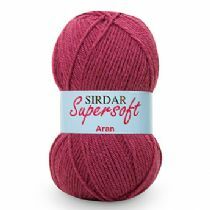 Sirdar Supersoft Aran will keep its quality through machine washing and tumble drying. Luxurious aran tweed Sublime luxurious aran tweed is made exclusively for Sublime in Southern Argentina using sumptuously soft baby Llama and the finest wool, blended together with a smattering of cotton neps in subtle accent colours. This gorgeously soft, tweedy yarn comes in inspiring colours, which work together beautifully to create luxuriously relaxed hand knits in stunning combinations for men, women and children. As you would expect from Sublime, luxurious aran tweed is machine washable and easy care.